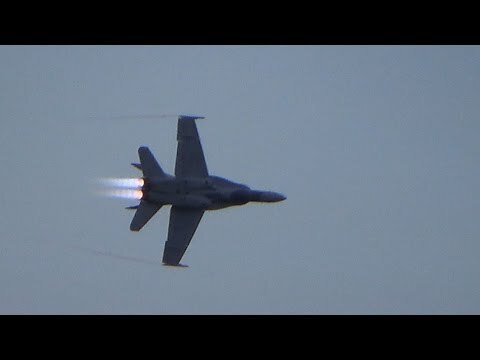 This is video taken from the 2014 Abbotsford Airshow Day Show in Abbotsford, BC. It was a unique experience recording this flight with my new camcorder during the day. I was in awe of the way it flew and the sounds it made ripping through the sky. 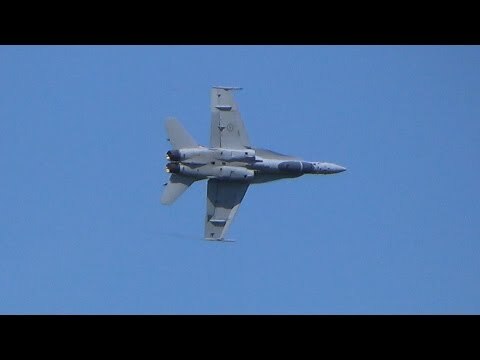 I was balancing between drooling and keeping it focused in the frame during this CF-18 Hornet flight at the 2014 Abbotsford International Airshow. The McDonnell Douglas CF-18 Hornet (official military designation CF-188) is a Royal Canadian Air Force (RCAF) (formerly Canadian Forces Air Command) fighter aircraft, based on the American McDonnell Douglas F/A-18 Hornet fighter but isn't new like the Boeing F/A-18E Super Hornet, F/A-18F, or Boeing EA-18G Growler. In 1980, the F/A-18 was selected as the winner of the New Fighter Aircraft competition, and a production order was awarded. The Canadian Forces began receiving the CF-18 in 1982. CF-18s have supported NORAD air sovereignty patrols and participated in combat during the Gulf War in 1991, the Kosovo War in the late 1990s, and as part of the Canadian contribution to the international Libyan no-fly zone in 2011. In 1977, the Canadian government identified the need to replace the NATO-assigned CF-104 Starfighter, the NORAD-assigned CF-101 Voodoo and the CF-116 Freedom Fighter (although the decision was later made to keep the CF-116). Subsequently, the government proceeded with the New Fighter Aircraft competition (NFA), with a purchase budget of around C$2.4 billion to purchase 130--150 of the winner of the competition. 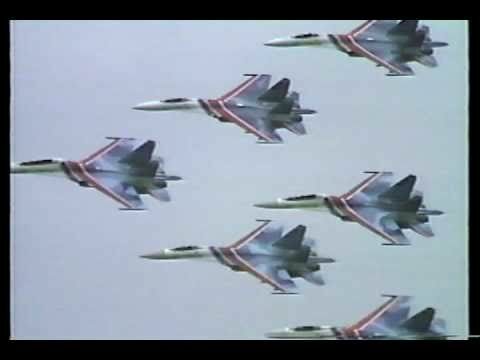 Candidates included the Grumman F-14 Tomcat, McDonnell Douglas F-15 Eagle, Panavia Tornado, Dassault Mirage F1 (later replaced by the Mirage 2000), plus the products of the American Lightweight Fighter (LWF) competition, the General Dynamics F-16 Fighting Falcon, the F/A-18 Hornet, and a de-navalized version of the Hornet, the F-18L. By 1978, the New Fighter Aircraft competitors were short-listed to just three aircraft types: the F-16 and the two F-18 offerings. The F-14, F-15, and the Tornado were rejected due to their high purchase price, while Dassault dropped out of the competition. The F-18L combined the systems and twin-engine layout of the F-18 that Air Command favored with a lighter land-based equipment setup that significantly improved performance. Northrop, the primary contractor for the F-18L version, had not built the aircraft by the time of the NFA program, waiting on successful contracts before doing so. While Northrop offered the best industrial offset package, it would only "pay off" if other F-18L orders were forthcoming, something the Department of National Defence (DND) was not willing to bet on. The F-14 almost entered Canadian service through the backdoor due to the Iranian Revolution. 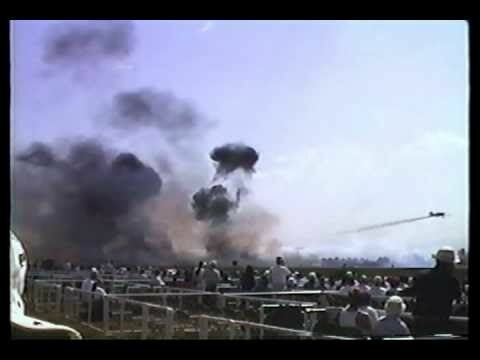 In the aftermath of the revolution, the United States cut off all military supplies to Iran, which meant that the Iranians' new fleet of F-14s would be potentially rendered unflyable due to a lack of spares. The Canadians offered to purchase them at a steeply discounted price. Negotiations ended before a deal was reached as it was revealed that Canadian involvement was crucial in the smuggling of American embassy personnel out of the new Islamic Republic. In 1980, the McDonnell Douglas F/A-18 Hornet was declared the winner of the New Fighter Aircraft competition. The order included 98 single-seat variants and 40 dual-seat variants, for a total of 138 purchased, plus 20 options (which were not exercised). The F/A-18 Hornet was then dubbed the CF-188. [N 2] In every context except the most official of military documents, the aircraft are referred to as CF-18 Hornets. Reasons for the selection listed by the Canadian Forces were many of its requested features were included for the U.S. Navy; two engines for reliability (considered essential for conducting Arctic sovereignty and over-the-water patrols), an excellent radar set, while being considerably more affordable than the F-14 and the F-15. A number of different fighter aircraft have been considered by the Canadian Forces as replacements for the CF-18 with the Lockheed Martin F-35 Lightning II, Eurofighter Typhoon, SAAB JAS 39 Gripen, and the Boeing F/A-18E/F Super Hornet all having been promoted as contenders by their respective manufacturers. According to Le Devoir, project costs without considering maintenance, training and spare parts, are estimated at $4 to $8 billion. Boeing has indicated the F/A-18E/F Super Hornet, a derivative of the F/A-18 Hornet, is a less expensive alternative at an estimated total cost of $4 billion. One of the manufacturers in contention: Boeing, BAE Systems and Saab Aerospace, had promised to assemble the entire aircraft in Canada although the name was not publicly disclosed.